Over the weekend of October 28-30, 2016 more than fifty brothers and wives from the early 1970s enjoyed a full weekend of activities including Friday evening dinner at Headliners Club, a Saturday morning tour of the Pike House, a Stubbs Barbecue lunch and tailgate on the grounds of Darrell K Royal Memorial Stadium before enjoying the Longhorn’s victory (!) over the Baylor Bears. Saturday evening brothers enjoyed small dinners throughout Austin and on Sunday attended a closing brunch at Matt’s El Rancho. Pike Alums and their families enjoyed the reunion tailgate. 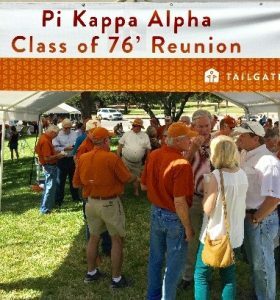 The circa 1976 Pikes at the DKR Memorial Stadium BBQ Tailgate. Charlie Beckham ‘73 chaired the organizing committee and was ably assisted by Barry Adkins ‘73, Tom Peel ‘73, Jeff Kuhn ‘74 and Doug Jones ‘73. 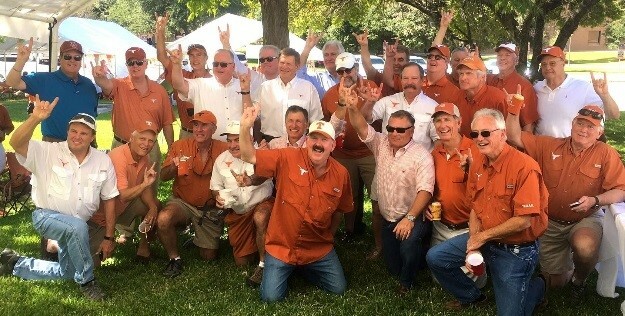 Amongst the many alumni attending were Grover Campbell ‘73, David Dies ‘73, Steve Dunn ‘73, Bill Gump ‘73, Will Jones ‘73, Mitch Owen ‘73, Stuart Ford ‘76, Bob Dedman ‘78, Jeff Hinson ‘74, Jay Lucas ‘76, John Murray ‘74, Greg Powers ‘72, John Rathmell ‘76, Randy Stout ‘70, Hoppy Strickland ‘71, Rusty Tamlyn ‘75 and Dr. Richard Vigness ’74 and apologies to those our scribe missed.